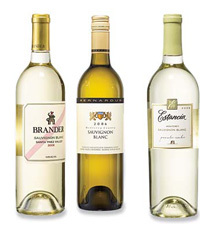 After tasting more than 300 affordable American wines, Senior Editor Ray Isle reports on his most exciting white wine finds. This is definitely one of the great wine bargains in the world. Lime-zest aromas, lively acidity, intense fruit—if you want to know why Riesling inspires such devotion, this is a great introduction to the grape. And starting with the 2006, Chateau Ste. Michelle sells this wine nationwide, instead of just in the northwest. A blend of Viognier and other white grapes from all over California’s wine regions, this crisp wine has floral notes and an appealing fruitiness. Most of Dry Creek Vineyard’s wines sell for well over $20, but this rich, melony, full-bodied white, made without a trace of oak aging, is a welcome exception. This easy-drinking blend of Chardonnay, Muscat and Chenin Blanc is aged in stainless steel tanks to keep its ripe, tropical flavors bright. It’s rare to find this much depth of flavor in a wine under $20. Pear and melon fruit, light floral notes and firm acidity all combine to make this Oregon white one of the best deals around, especially in a great vintage like 2006. Plus, it’s from a winery that’s dedicated to eco-friendly sustainable agriculture. 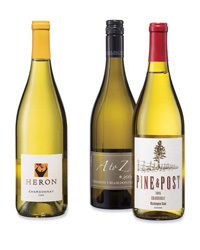 From one of the top producers in New York state’s Finger Lakes wine region—itself one of the best regions for Riesling in the United States—this pear-inflected, vibrant white wine makes a great partner for seafood of any kind. Paraiso’s vineyards lie on the windswept slopes of California’s Santa Lucia Highlands, inland from Monterey. The region’s cool ocean-influenced climate is one reason why this dry, nectarine-scented Riesling is so refreshing.